Graeham Goble doesnt mind reminiscing. In fact, he enjoys a trip down the memory lane of his vast songwriting repertoire. But hes not stuck in the past. All through a lengthy conversation about his Little River Band days and the songs that have made him one of Australias most successful international songwriters, Goble is itching to get into the studio to play some of his latest compositions. The new work he is most excited about is Initiation Suite, a 15-minute opus that he hopes will form the basis for a film. Its nearly 30 years on from his first LRB song, Its A Long Way There, and a lifetime of experiences and songs separate the two, yet the similarities are striking. Lengthy works that break new ground. Goble is facing the new millennium with relish. Im always pushing the music in a different direction, he says. His most successful song, Reminiscing, which LRB recorded in 1978, earns Goble a Four Million Air award from US collection society BMI this year. That means the song has been broadcast over 4 million times in America, the highest achievement for any Australian pop song internationally, putting him in an elite group of writers, according to BMI. With dance duo Madison Avenues new version of the song being released in the US, the performances are likely to increase again. Goble is elated. The transition from banjo to guitar was unusual. The banjos tuned differently to guitar, so I just found my own chords. Then eventually I made myself a guitar with four strings on it and tuned it like a banjo. And then all my early songs were written on four-stringed guitar tuned to banjo." His first major band was Mississippi, and his composition, Kings of the World, their biggest hit. Mississippi ended and Little River Band began almost simultaneously in 1975, with a song Goble had written back in 1972, Its a Long Way There, opening LRBs debut album. Goble, who has spent most of his adult life engaged in spiritual study  not religious study, he emphasizes  believes that songs are created in another realm. I believe very much in spiritual realms, and I believe in things like guardian angels and the angelic realm, and my studies have taught me that when we sleep our soul leaves our body and we go up and have interaction with the spiritual realms. And I think that's where it comes from. Gobles philosophies were at odds with band-mate and sometimes co-writer Beeb Birtles, whose strong fundamental religious beliefs lent themselves to lavishly harmonic LRB songs with overtly Christian themes, such as Fall From Paradise. I got roped into it and I didnt like it, I hated it, Goble says of the assumptions that he, too, was a Christian songwriter. Glenn Shorrock and Goble butted heads constantly; as with many other international bands renowned for sumptuous harmonies (think Eagles, CSNY), behind the scenes there was internal disharmony. Shorrock disliked Gobles song Lady, which has now notched up well over 2 million airplays in the US. Goble says he largely admired Shorrocks writing. 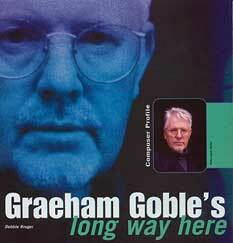 After LRB, Goble put together a group called Broken Voices to record one album, and he has since released two solo albums, Stop and Nautilus, the latter including his favourite recent composition, Restless Heart. Using session singer Steve Wade, both albums were showcases for Gobles post-LRB songwriting output, but kept him in relative obscurity. Now he has moved one step beyond, and is singing lead vocal on the material he is recording. The songs he is writing now reflect his long spiritual journey, as well as more earthly concerns  the break-up of his 24-year first marriage, and his subsequent remarriage. His studies in numerology have influenced him to change the spelling of his first name, and a feng shui expert has been consulted in the layout of his new house and studio. And while there is always time for reminiscing about the good and the bad, the future is what excites him. And those songwriting angels above.